Big M&A opportunities are few and far between in the sector so news from Bloomberg that Western Union (WU) is looking to sell its business arm (WUBS) is noteworthy. WU built the division up via two main acquisitions 7-9 years ago. Having written off $464m of value related to this in Q4, it is seeking to recover the balance. WUBS boasts a large range of financial institution clients and $384m of revenue for FY2017. What is unclear is how easily the business and it’s systems can be unravelled from it’s parent and potentially migrated over to a buyer. Like its parent company, Western Union, Western Union Business Solutions is focused on the foreign exchange and international payments market. Western Union Business Solutions branched out from this company in order to focus on business payments, and has grown a company focused on unique business solutions for businesses that frequently make international payments. We are likely to see many types of buyers interested in purchasing Western Union Business Solutions. 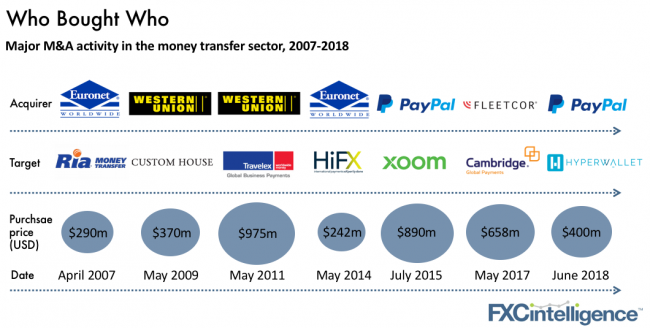 Some possibilities include a foreign entity like Ant Financial looking to break into the business payments space, a startup looking to easily integrate an already developed business payments solution or even an older, established company like Euronet.